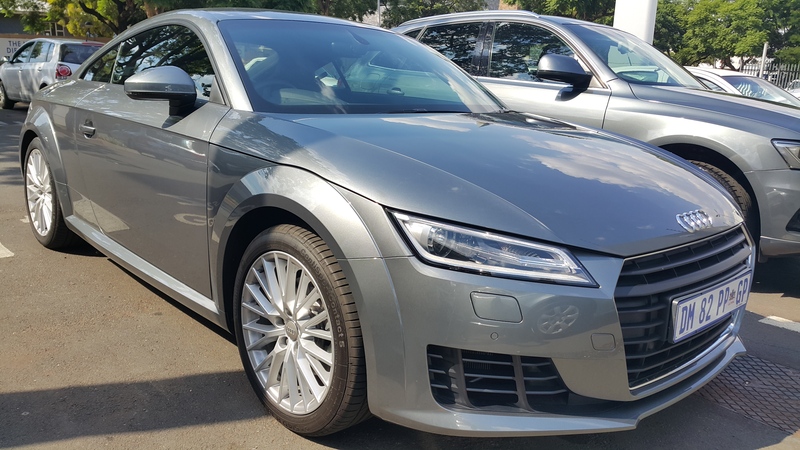 New Audi TT 2.0 TFSI – 169 KW PowerHouse! Stepping into the Audi TT was like jumping into a fighter plane. It was the first time I felt that way, ever since driving and testing cars in 2008 as part of my sales training with BMW. We often drove competitor cars, so that we could deeply understand the differences in each car, and internalize that knowledge. The only time I have felt similar to this, when jumping into an interior, was jumping in the BMW 8 series 850 for the first time a few years ago. That car for me, was also very cleanly laid out and even though it is more than 30 years old now, I still feel the ergonomics and switches were absolutely worth the money! Many manufacturers battle to design a car, that will still be wanted as a classic 30 – 40 years later. BMW somehow manage to keep that flame going – years on, especially at times, with cult followings behind a specific model like the E30 M3, 325 IS and E36 ( especially in SA). In terms of Audi, this began with their racing pedigree, especially around Rally cars and their Quattro system. Nowadays this is focussed more on Le Mans and all of their 24 hour LMP24 models that have emerged victorious in recent years. So with the Rally off-road Quattro system and the combination of all the knowledge gained when things go right and wrong off and on the track, Audi continue to produce quality vehicles that set benchmarks for quality and style. When they launched the TT a few years ago, same as the Z4 and Porsche Boxster, any convertible car was dubbed as a “hairdresser`s car”. This kind of stigma comes from God knows where- but it is certainly not South Africa. That was dubbed in the USA and spread around the world. This car the all new Audi TT, is the furthest thing from a weekend toy, and is more meant for racing from one meeting to the next, for the very powerful people that trust Audi, who don’t want to flash their wealth, but also love speed. The most striking thing that Audi has, is a sameness across the different models that they produce. The Quattro model is the model that I drove – and the lines and the interior are by far the best that I have seen from Audi, besides their very dynamic Audi R 8. This car is meant to evoke emotion. And jumping into the cockpit and seeing the virtual display come to life, the amazing soft touch features and sense of calm the interior evokes, beat even any Mercedes SLK or BMW Z4 I have driven. Audi just seem to be nailing their interiors, and we love it! The cabin and ergonomics on most Audi cars, are a lot like their drivers. Also very driven people, focussed and in management, but without letting the whole world know about it, like the other two major Germans. The Audi is discrete, not as quiet and subdued as a Lexus and not near as outspoken as a BMW. The lines and softness of the old TT is done away with, with Audi opting for a more defined shaped exterior. Less cuddly teddy bear TT, more Transformers, “let`s get this driving thing going” kind of feel! There is a sense on the exterior of this car that the shape is meant to cut through the air much more than the old TT. And where with the old shape, you would normally use the car only on Saturday or Sunday, cruising on the weekend, this new car is meant to be taken to very serious business meetings daily, that need answers right now! The Drive on this Audi – is softer than you would imagine, for a car that I just described above as having loads more involvement calling on the Audi brand`s, racing pedigree. The language of the car, is defined in how it`s driven. And this car speaks fast fluently. The model we had on test, was the Quattro 2.0 FSI pushing out the same torque and power as its GTI VW sibling. The car is smaller, lighter and faster than anything I have driven from Audi so far, and I loved it. Where I sometimes felt the A3 and A4 lacked steering feel and charisma on the road, this TT made up for all those really bad days spent in traffic on the road. It is amazingly comfortable, and I definitely expected more rough handling – especially in Sport mode, but this car managed my spine just perfectly! We drove the Q3 and the TT next, and I felt like Audi`s suspension engineers should be given 10 points for the effort on sheer comfort on the road. The TT handled like a go-kart. I put it through its paces, on the streets and highways – around Pretoria, and it handled it up. It felt solid, and planted – which is thanks to the securing Quattro system. It also felt more nimble than a Z4 – and less bulky than a Merc SLK, which is something very difficult to achieve with improvements in cars being made every single day. This TT provides a feel for the “Drivers” who love driving. Being German, racing on the AutoBahn, and staying alive – have to be the 3 reasons why this car was developed with such precision. I feel like Audi have really focussed here, and if I had an additional R 600 000 right now, this car would be on top of my list of must haves. Working the interface of the Virtual Cockpit, which is the digital screen that replaces the standard instrument cluster, is an absolute dream. What I love seeing is innovation, and far beyond what other firms have done, this machine is a beauty. The main aim of this cluster, is to keep you focussed on the road. 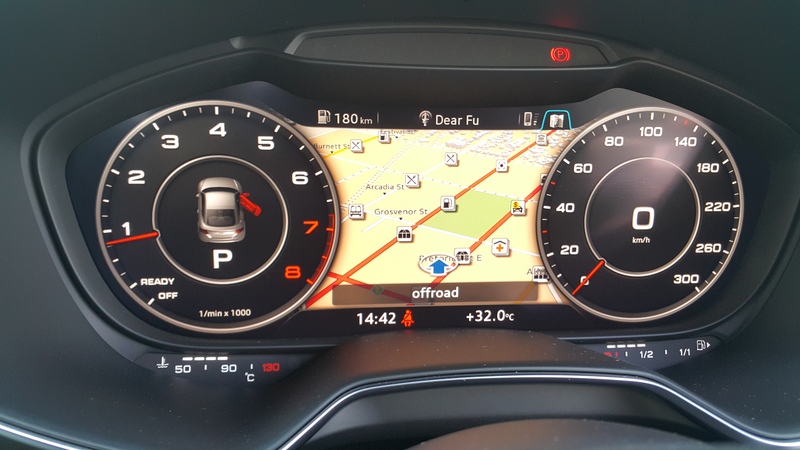 You have a large screen – the same area as that of the old instrument cluster – which is purely digital, meaning you can toggle between speedo and rev counter in race mode – and move to normal – which brings up the Sat NAV map in the area between the two counters. You can even vary the size of the speedometer and rev counter – to two smaller rings. This is an amazing system, which is am sure can enhance safety with inner city driving. 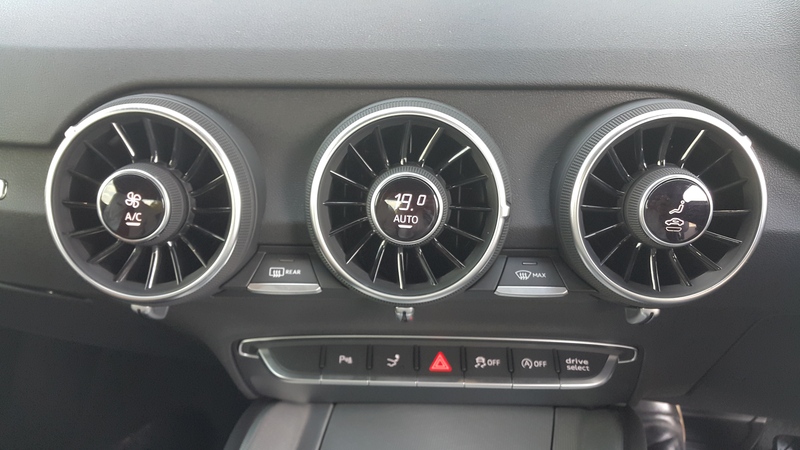 By taking away the need for the centre screen – the aircon fan speed and temp settings, are also inset in the middle of the air vent. When power is off, you can barely tell that that is a digital display too – showing fan speed and temp. Working the interface system – NAV and Bluetooth – are both not difficult. 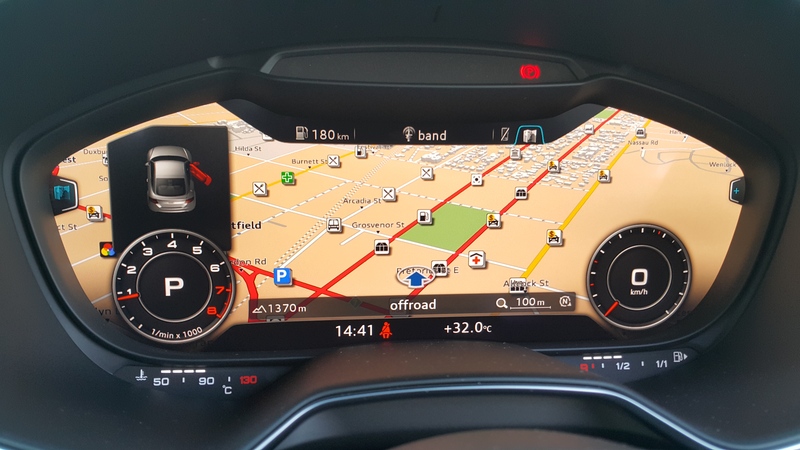 The ergonomics and interface of most Audi systems are great – even a fingerprint recognition system on the main scroll dial – so that you can draw letters with your finger, to bring up the corresponding title on the menu. Audi are great at technology – and the Virtual Cockpit is a fantastic concept that I am sure will be copied in some way or the other by other manufacturers. See how the dials can be made smaller? The little time we spent with this car, was just under 1 day, so not nearly enough time to get through all of the little niggles that can appear in the first week when you do buy a new car. In my view, this car is very solidly made. It doesn’t feel too heavy, drives amazingly well – and handles like it`s on tracks even at high speed. I wonder if German firms would even have focussed on high speed stability, if they had never built the Autobahn? Whatever the case, the new Audi TT is set to move away from its stigma – being priced from R 587 000 upwards – before any extras are added on. This car is great to drive – and has a boot big enough for two small bags – and 2 extra seats in the back for your legless children. I have a strong feeling though, no traditional family man will be buying this car – only those whose kids have already left the nest, or Single career executive ladies, who want to make a statement about where they at in their careers. Our friend Anna Adams, pointed us to this amazing car and dealership – Hatfield Auto, is an example of such a professional. 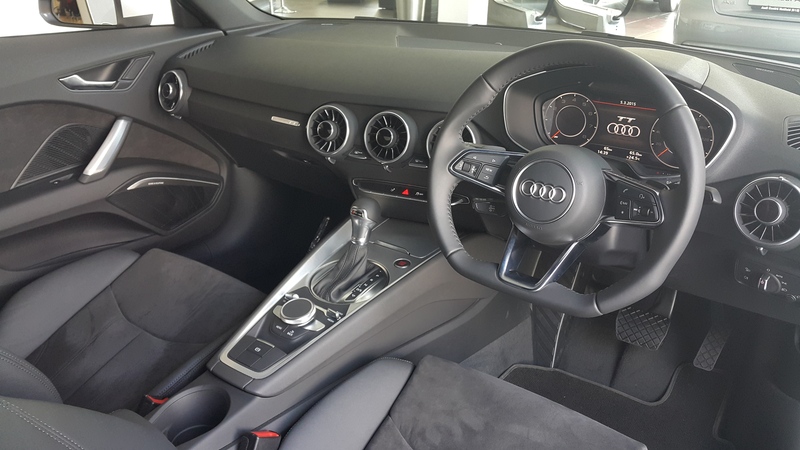 They are truly great at their services offered and Johnny Maartens was the Audi Brand Specialists I dealt with, and once again, this car scores top marks in my books, backed by service delivered by the nicest guy we have dealt with yet! He is completely professional and efficient and has been with Audi since his son was little – over 18 years ago. In order to get good service, I often drive a little further. In this case, Audi Hatfield have my vote of confidence, so ask for Johnny Maartens when you get there. This entry was posted in Audi, Car Review, Car Test, South Africa. 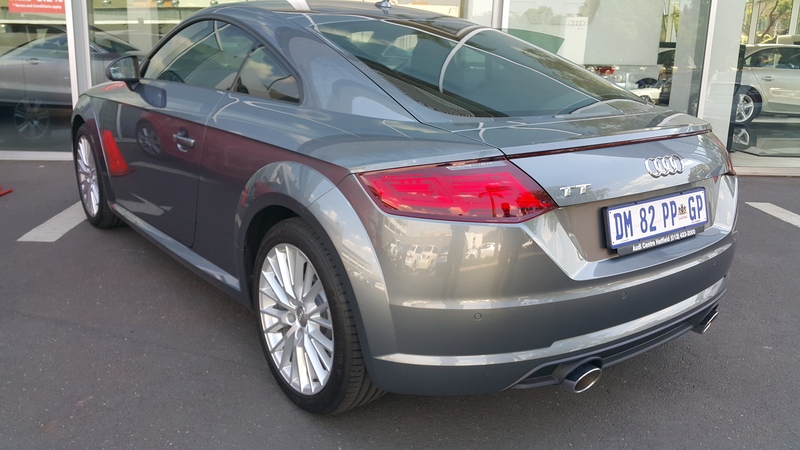 Tagged 169KW Audi TT, 2015 Audi TT 2.0 TSFI, Audi SA, Audi Test, Audi TT, Audi TT Review South Africa, Car Test Audi TT, Review Audi TT, Test Audi TT, TFSI. Next Post Next post: Oettinger Golf 500R with 381 KW – Direct from Germany with love! 100% Ryan. This car is amazing to drive. Much better handling than the old model, which didn’t do so well in the corners. On the wife side, well that’s like the United Nations. Mutual decisions are always better in any open forum! Good luck!